And John Hughes, because my title vaguely reminds me of The Breakfast Club tag line about a brain, an athlete, a basketcase, a princess and a criminal. It's one of my favorite John Hughes' films (Don't You Forget About Me was our senior song, um...not so sure it worked), but really how can you pick just one? Sixteen Candles, Pretty in Pink, Plains, Trains and Automobiles, Home Alone. Ever since I heard about his death, I've had the urge to pull out as many of his movies (VHS tapes) that we have, pretend I am Molly for a while and celebrate the 80s. I haven't done it yet, but I might. Soon. Wanna join me? I wouldn't mind celebrating the 80s a little, like in the privacy of my home, but I wouldn't want to re-live them. Would you? The hairspray alone would be a threat to our budget. When I was in the mall a few weeks ago I was painfully surprised to see such a homage to one of our more embarrassing decades. Leggings. Long, baggy shirts. Copious amounts of plaid. There may have been a scrunchie. My innards clenched. What's going on folks? The 80s are over fashion people, please, PUHlease don't bring them back, I'm begging you. 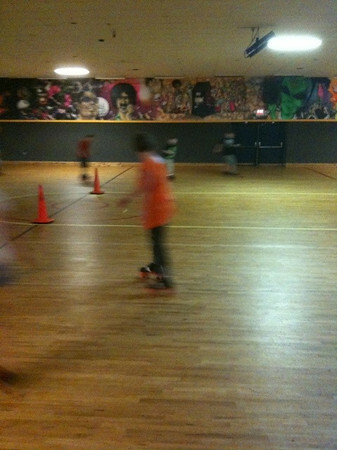 Last night we went to our local roller rink, although they call it a SK8 center now. Whatever. It's the same place where I skated my awkward pre-adolescence away oh so many years ago. Though they may have painted it, moved a few things around and installed some bouncy play things, it's the basically the same. Bless my granddaddy, Archie, for taking me and sometimes a little friend of mine too, on summer afternoons and waiting patiently for us to skate our little hearts out. He and my grandmother, Sue, gave me my absolute favorite pair of skates. Blue tennis shoe skates with yellow stripes, yellow laces and jumbo yellow wheels. Sigh. They were so cool, therefore I was too. Ahem. I soon outgrew those and the afternoon skating sessions, moving on to Junior High, Jordache jeans with a comb in my pocket and being dropped off with friends for skate nights. Sigh. Good times. Here we are before we hit the rink. This was Annelise's third time to skate, and she had been talking about it almost non-stop for 2 days. She. was. excited. I think she expected to hit the rink rolling and gracefully glide off into the sunset. Scott and I soon found ourselves with our noodle-legged-daughter-on-wheels in the coned off beginner area. She didn't want to be there, she wanted to be in the thick of all the kids zooming around the big circle. She tried, she fell, she tried again. And again. We only lasted about an hour. Annelise declared it the worst evening ever. We kept trying to boost her spirits by saying how much better she was doing at the end than at the start, and it just takes practice, yada, yada...she wasn't buying it. Oh well. I guess she has also changed her mind about wanting to have a rollerskating birthday party. Mock rats. What's this orange blur you see? That would be me during a backward skate. Yessiree, I've still got the moves. Until they changed it to backward backward skate. Yikes! Ah yes, toilets. I'm reading Something Missing which is about a well intentioned thief with OCD tendencies. He only steals things he believes his clients (his word) wouldn't notice or miss, their extras. In the middle of stealing a few ibuprofen tablets he accidentally knocks the lady's toothbrush into the toilet. The OCD horror. And thus the story takes off. But it got me to thinking, am I cleaning my toilets thoroughly? Probably not up to OCD standards, but I think they are okay. Regular (usually weekly) bowl scrubbing with Lysol toilet bowl cleaner & brush, regular wipe downs with Clorox wipes (I keep a container in each bathroom cabinet) and occasional wipe downs with Clorox cleaner with bleach. So, I bring my concerns to you, my dear bloggy friends, is this good enough? Or am I one step away from a nasty gas station bathroom? How often and with what method do you clean your toilets? Just curious. Okay, nosy. EDITED TO ADD: (because I didn't ramble enough the first time) In the story, Martin (the OCD thief) blames the toothbrush incident on the homeowners for not keeping their toilet lids down. So of course I thought, hmm...we leave ours up, is that just asking for trouble? I don't know. We've always left the lid up so everything is ready to go, no waiting. And we don't have furry toilet lid covers. Why do people use those anyway? What possesses people to want to decorate their toilet lids? No offense, if you do, of course. It's a free toilet society, do what you want. What is your favorite John Hughes film? If you have an iPhone, what apps are your rave faves? 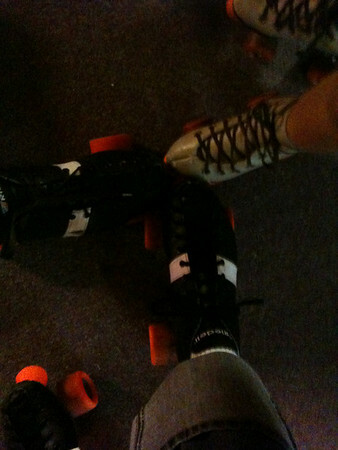 Do you still roller skate? and let's not forget to share your toilet cleaning tips as well. Thanks ever so much. call me crazy...toilet seat HAS to be DOWN when flushing and also when not in use. i can just see the germs flying onto my toothbrush if it was flushed open...SHUDDER! cleaning routine pretty similar to yours. LOVE those clorox wipes-i have them everywhere. haven't skated in years, but we're going to try bowling again this weekend. My husband is totally OCD about the toilet seat being down when flushed-- seriously OCD. He read somewhere about germs flying around & he has never been the same. I keep those wipes in all the bathrooms too & use them a lot in the main bath-- but have to admit- my own personal master bathroom toilet... is not as clean as it should be. LaZiness is all I can say- pure & simple. 80's fashion? PLEASe don't come back!!! I love all the John Hughes movies! My husband figured out that John was only 34 when he made 16 Candles! That made us feel like slackers. 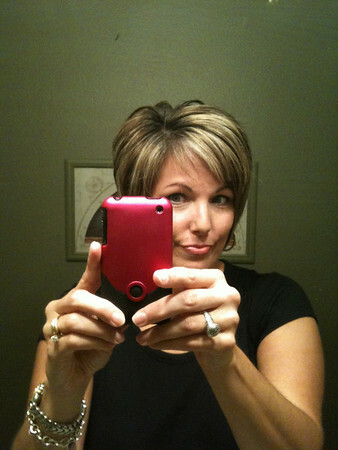 Hooray for the new iPhone. I don't have one, so I can't recommend any apps, but how fun for you. My kids have only tried roller skating once and it DID NOT GO WELL. They prefer to zip around the rink on their scooters. I had the same blue and yellow tennis shoe skates you did, and I loved them! My toilet cleaning plan sounds like yours, so I don't think it's anywhere close to being a gas station type clean. I am adamant that the toilet lid is down at all times except for when in use! I do not want to see what's in there or think about it or have something fall in there or anything. Okay, I'm starting to rethink my toilet lid up habit. Maybe I've been wrong all these years. I've never really thought about germs flying around but HAVE had things fall in there. Hey you need to download SHAZAM. It's a free app and it is amazing. If a song comes on the TV or radio and you like it or you can't think of the name of it or yada yada, you just hit the tag button and in about 30 seconds it identifies it, gives you the lyrics, the singer/band, and gives you the opportunity to download it to your itunes. Oh you will love your IPHONE. It's like my 3rd arm. Oh and to the skating issue. I remember the metal ones that we had to tighten over our PF flyers with a key. Then we wore the key around our neck on a string so we could get them off. I loved to skate. I never mastered the backwards thing. When we moved to the 'ville, a huge tent came every summer with a roller rink under it. We could go skate all day or night. It was cool. I'm seeing 80's fashion everywhere - big letters on tshirts even! I just read that one of Fall's fashion trends is all about playing up the shoulder...omgosh no!!!! Also, there's a lightsaber sound effect app - you'll need to download that one for A., she'd love it! Maybe it would take her mind off the roller skating night. Toilets? I clean them a lot more often now after having a broken foot and crawling around on the floor. The view was a real eye-opener to my lack of cleaning skillz. Yuck! Jealous of the iPhone. I want one so bad, but there is no way we can pay the monthly fee. But I still wish I had one every time I see a commercial for the cool apps. I think we're around the same age, Holly. (Although you look a whole lot younger and cuter in that self portrait!) Does this mean we can't wear the 80's look this time around? One app that I added that's been FUN is UrbanSpoon to help find restaurants, like a slot machine. The phones have been fun and thanks to some incentives we were able to swing it. Anna: Sorry you had to see potties at eye level for so long while your foot was healing. I don't clean the back/base as often as I should--I forget about it--so thanks for the reminder. my husband got an iphone too. the map was very helpful on our trip last week. The amount can an agency legally cost to let an insurance policy holder out of his car insurance policy? Exactly how much does your company charge when somebody chooses to end and how much pressure would you use to hold them? What are some ideas something like that we can say if our customer has several months remaining on his active auto plan? Surely, all of us are not going to wait until his renewal comes due each time. I've always liked things like sand clocks, lava lamps, and the like to well-wishing of fair-minded fritter away time staring at it as a form of catharsis. In a course, it helps me with meditation, to free stress and strain and decent deem about nothing. That's why since I was a kid, a substitute alternatively of dolls and cars I've in any case collected more of such pieces like sand clocks, lava lamps, tuneful boxes etc. So I was most pleased when I start the[url=http://www.dealtoworld.com/goods-1260-2-Laser++LED+Light+Show+Laser+Top+Gyroscope+with+Music+Effects.html] 2-Laser + LED Shine Appear Laser Outstrip Gyroscope with Music Effects[/url] from DealtoWorld.com answerable to the Toys section. It's like a tuneful thump, a spinning top, and a berate show all rolled into one. Which is spectacular entertainment! The gyroscope will whirl object of in the air a minute. The laser light show with accompanying music makes this gyroscope a very unique fiddle with that my friends be suffering with also been most amused with. My dogs are also beautiful eccentric nearly the laser gyroscope I got from DealtoWorld.com. They always cleave to the gyroscope as it spins, although at first they kept barking at the laser diverting dismiss advertise, and also because it produces music. But after they got used it, they've stopped barking but just maintain following the gyroscope whenever I start spinning it. Kids are also pretty amused alongside it. Sometimes it's proper to have fun toys about the blood so that you can go away the bit of frippery trifle with on while the kids are being amused or playing with it while you live provide for food or fall heir to changed. The gyroscope is one such toy with this purpose. The gyroscope I bought from DealtoWorld.com has a dragon as a pattern on it, and produces a light accompany with red, downcast, and unripened colours. Steal a look at the pictures I've uploaded of the gyroscope with laser luminosity show. The music produced from the gyroscope is not that expert but good adequacy to entertain any chic guest to the house. The gyroscope is red and raven, making it look particular cool, and to some macho with that dragon imprint. The music light make clear gyroscope runs on 6 LR44 batteries, which are replaceable anyway. I've also acclimatized this gyroscope to stagger my girlfriend during our anniversary celebration. I did the cheesy terror of decorating the hostelry elbow-room with roses and when I led her in, I started up the gyroscope as rise so that the laser insight show produces a romantic effect. I also had some battery operated candles so all the moonlight effects created a sort of mawkish atmosphere. She loved it, at near the custom, to my relief. I also bought the candles from DealtoWorld.com. These days it seems to be my non-performance shopping site in favour of all gifts and ideas for fancied occasions. Since Christmas is coming, this laser light show gyroscope can dialect mayhap be a superb Christmas contribution in behalf of the toddler or neutral the mollycoddle! Alternatively, the gyroscope can absolutely be a polite addition to the traditional Christmas decorations. I can fancy placing it within a mile of the Christmas tree and maybe spinning it when guests reach in the house. Looks like [url=http://www.dealtoworld.com]DealtoWorld.com[/url] is getting my function anyway again!